The flight data recorder belonging to AirAsia flight QZ8501 has been lifted from the Java Sea, the head of the Indonesian search and rescue agency said. Divers have also found and reportedly lifted the plane’s second black box. A team of Indonesian navy divers on Monday retrieved the first black box from the plane, which crashed on December 28 killing all 162 people on board. “This morning I had an official report from the national transportation safety committee. At 7:11 we had succeeded in lifting the part of the black box known as the flight data recorder,” Fransiskus Bambang Soelistyo, head of the search and rescue agency, was quoted by Reuters. 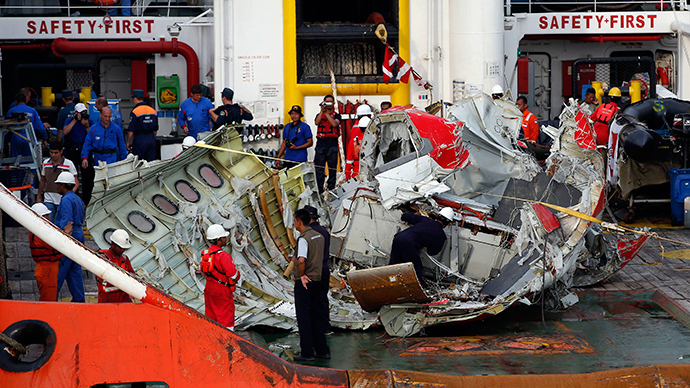 The flight data recorder is in good enough condition for data to be retrieved, said Tatang Kurniadi, the head of the transport safety committee. It has now been transported to the mainland. According to the chief of Indonesia's National Transportation Safety Committee (NTSC), it will be read in Jakarta tonight or tomorrow, but the interpretation of its data may take as long as a month. “The download is easy, probably one day. But the reading is more difficult ... could take two weeks to one month,” Siswosuwarno told Reuters. Hours later, the location of the cockpit voice recorder (CVR) had also been established – 20 meters from the flight data recorder. The second black box was retrieved and lifted from the wreck onto an Indonesian navy vessel on Tuesday morning, Indonesian news channel MetroTV said, quoting a transport ministry official. It is expected to be sent to the capital for analysis, Reuters reported. The AirAsia QZ8501 search and recovery operation is an international effort, with Indonesia getting support from Singapore, Malaysia, Australia, South Korea, Japan, China, the US Navy and Russia’s Emergencies Ministry.